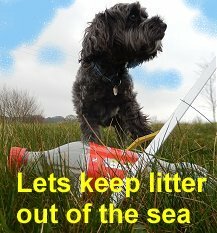 If you are reading this, you are probably also careful how you dispose of litter, but by observing the use of litter bins in public locations, it is clear that many people are less careful. The good intentions of people who DO take care to segregate their litter, are often undone by those who put general waste in the recycling sections without thought. If on-street recycling is to work, every obstacle to cross contamination of recyclable materials must be removed. Bins must be conveniently placed, and it must be very clear what goes in them. Bins need to be in places where they are most in demand – e.g. beside food ‘to go’ outlets such as coffee shops and fast food outlets. Could these businesses be encouraged to provide, and routinely empty, adjacent bins? The people who empty on-street bins could advise which bins are over/under-used. 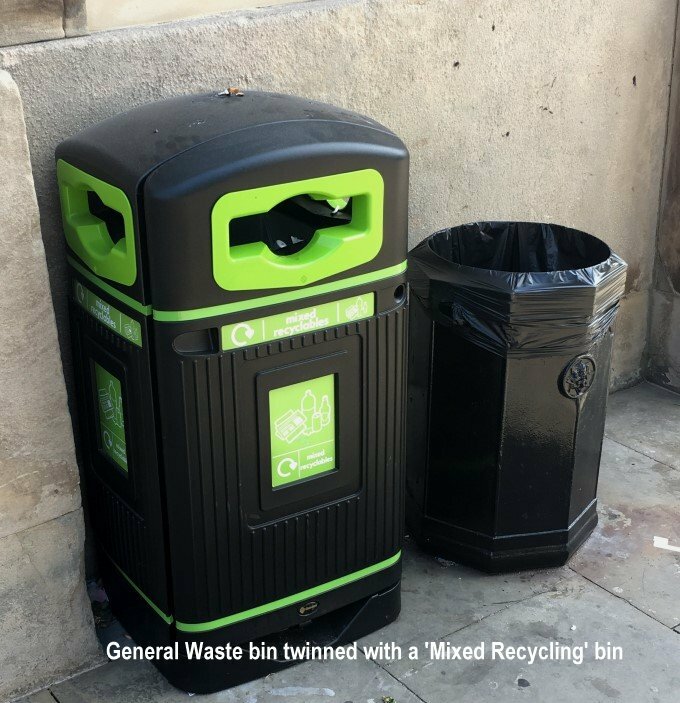 Bins should never be allowed to overflow – it would signal that not even the authorities care about litter or recycling. Each recycling bin needs to be twinned with a general waste bin. People won’t turn away from the 'wrong' bin and walk any distance to the 'right' bin. If recycling and general waste bins are separated, they are treated as interchangeable, and the contents become no different. Contamination of recycling is reduced if the general waste ‘twin’ has a bigger ‘mouth’, making it the easier target for those unconcerned with recycling. (though in the case illustrated, this 'Big Belly' bin claims the advantage of solar powered compaction for less frequent emptying). Note also that the left bin has only one bag. 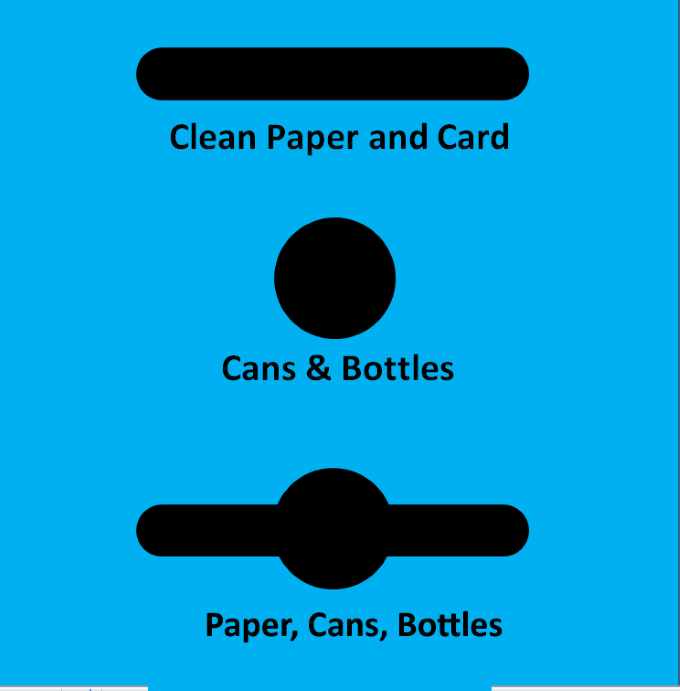 No attempt is made to separate paper, bottles and cans. This arrangement suits co-mingled recycling systems such as Cheshire East’s. Labelling bins as simply ‘Recycling’ is not helpful – since there are wide regional variations in what items can be recycled. However, detailed lists also increase contamination, because they require more time to comprehend than most people are willing to devote. 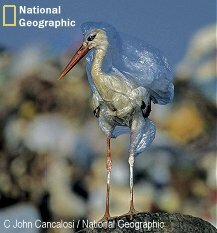 and since almost all bottles on the street are plastic, it is not necessary to differentiate between plastic and glass bottles. There is some international standardisation on the shape of holes to mitigate the need for translation - in airports etc. - but sadly the 'code' is not widely known. A blue surround seems to be the preferred colour, rather than green. 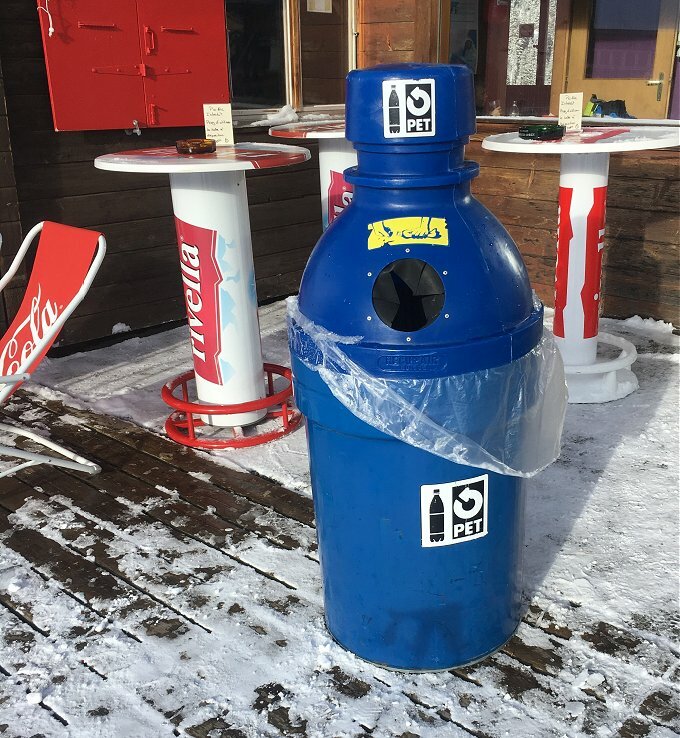 In outdoor places, there is not much clean paper to be harvested (uncontaminated by food remnants), so it may be better to aim to harvest only bottles and cans. Hopefully, this problem will be minimised when the proposed scheme of deposits on bottles and cans will dramatically reduce the numbers found in litter - both by motivating the purchaser to recover the deposit, and by encouraging scavengers to harvest any that are dumped.